A few years ago I received a Turkish cookbook from my college roommate’s mother. Knowing how much I loved cooking, she thought I would enjoy learning more about Turkish foods and how to prepare them. She was right, but I didn’t count on the learning curve. There were two main things that gave me trouble: 1) everything in the cookbook was in grams so it required math every time I planned a meal (note: math is not hard, but dude, still math), and 2) there were a lot of ingredients I could not readily identify. One ingredient that gave me a lot of trouble is one called Kofte Spice. It isn’t found on American grocery store shelves, and I couldn’t find any definitive info on the Internet. That left me with one (and really, really good) solution – email Mrs. Bulut for more information. Through a series of emails she explained to me that Kofte Spice would vary in content based on the region in which it is used. In Turkey, it consists of a mixture of dried herbs and spices – mint, oregano, parsley, salt, cumin, pepper, coriander, ground cloves, and nutmeg. We discussed the proportions of each herb and spice to create the blend that would be most like the kind used in Turkish cooking. We landed on a combination that was flavorful and delicious. So last week, when I picked up a package of Gold’n Plump Ground Chicken, I decided to give this recipe another try. Different than traditional Turkish Kofte (uses lamb or beef, and is formed into football-like shapes and pan-fried), I decided to make a few changes and good use of the abundance of herbs growing in my garden. The resulting recipe was delicious – and like many State Fair foods have proven, kids will eat anything that is served on a stick. This recipe was light and flavorful, and meal prep was shortened by making most of it a day ahead and doing the final cooking at dinnertime. Combine chicken, oregano, parsley, and mint until well mixed. In a separate bowl, combine salt through cloves. Add to chicken mixture and mix until fully incorporated. Place in refrigerator for at least an hour, up to one day ahead. One hour before cooking time, soak 8 bamboo skewers in water. Then, when ready, preheat oven to 350° F. Just before cooking, spray broiler pan with cooking spray. 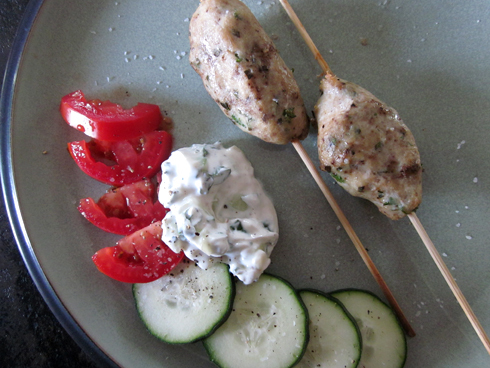 Divide chicken mixture into eight portions and roll into an oblong shape, then place on skewer. Add all the kabobs to the broiler pan and cook for 25 minutes, turning once. Remove and let cool a minute before serving. Mix together all of the sauce ingredients and refrigerate for at least an hour, and up to 24 hours ahead. Place on a plate with sliced sides and add two chicken kabobs to each plate. • This meal was pretty light. Next time, I might add a pita and some lettuce to the meal – either all tucked inside the pita, or served on a plate. • To make this non-dairy, substitute non-dairy sour cream for Greek yogurt.